Alex Ovechkin scored two goals and set up two more to lead the Washington Capitals to a 5-2 win over the Vancouver Canucks on Monday. 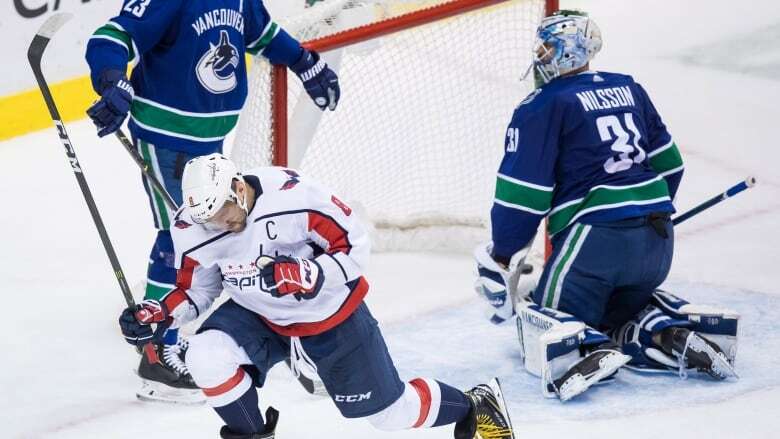 Travis Green thinks the Vancouver Canucks can learn a thing or two from how the Washington Capitals played against them Monday. Vancouver's head coach said the Capitals came out fast and strong in the 5-2 win, showcasing highly skilled athletes who consistently make plays. "They don't just go out there and just play summer hockey. They play the game the right way," Green said. "These are valuable experiences and lessons for our players, our young players especially." There's a reason the Capitals are the NHL's reigning champions, Green added. "They're big, they're strong, they're skilled, they win puck battles, they manage the puck. They do everything that Stanley Cup winning teams do. And they're deep," he said. "Man, that's a good hockey team." Alex Ovechkin had two goals and two assists for the Capitals (4-2-2) and John Carlson, Evgeny Kuznetsov and T.J. Oshie also scored. Troy Stecher and Sven Baertschi responded for the Canucks (5-4-0). Braden Holtby stopped 22-of-24 shots for the Capitals and Vancouver goalie Anders Nilsson turned away 28 of 33. Penalties played a big part in the game, with Washington netting two power-play goals and the Canucks getting one of their own. Vancouver's second goal of the night came when the Canucks had the man advantage to start the third period. Right winger Brock Boeser fired a hard shot on Holtby seconds into the frame. The puck bounced off the goalie's pads and on to Baertschi's stick. Holtby didn't have time to reset before Baertschi fired a rocket past him for his third goal of the year. The Canucks have been working on capitalizing on those kind of opportunities, said centre Bo Horvat. "For us on the power play, we've talked about taking more shots, playing more direct and not trying to be too cute. [Boeser] made the right play, put it on net and [Baertschi] was right there for the rebound," he said. But the team also took too many penalties and Washington was able to capitalize on them, Horvat added. "They were moving their feet, getting on the forecheck, taking the play to us at times," he said. The Capitals lead the league in power-play goals, with 12 on 31 chances. Washington coach Todd Reirden said he liked the way his group played, landing hits early on and scoring just over two minutes in. "I thought we were emotionally invested right from the drop of the puck tonight and that gave us a really good advantage," he said. Monday's match also showed how far Ovechkin has come as a leader, the coach said. The Capitals captain got the puck late in the third period after Vancouver had pulled Nilsson from the net. Ovechkin had an opportunity to score for the hat trick, but instead of letting a shot rip, he passed to Oshie. "To me that's a huge thing. ... He could have easily scored himself but it wasn't even a thought," Reirden said. "It doesn't bother him one bit and that's where you saw maybe a different player than maybe you saw three or four years ago that's not focused on individual stuff." Even Oshie questioned the move, Ovechkin said with a laugh. "[He said] 'Why you pass me the puck?' But he was so wide open and I try to give him pass. Save mine for next time," said the Russian superstar, who now has eight goals in eight games this season. 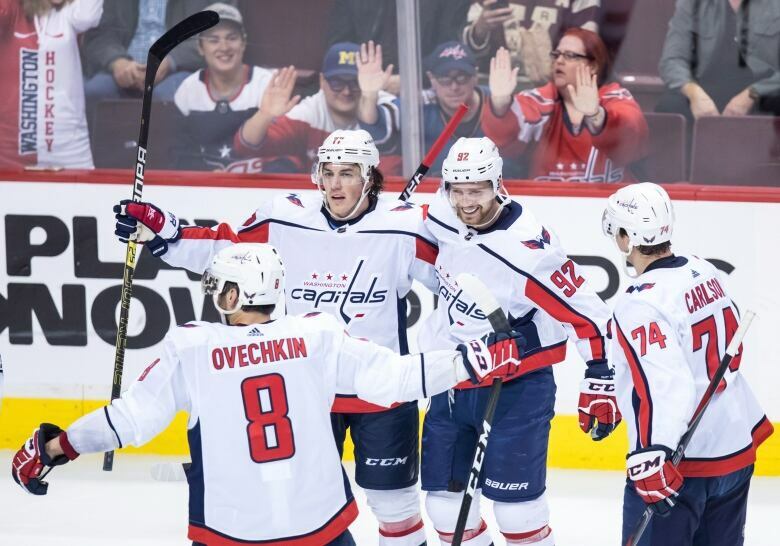 Monday's game was the first in a four-game Canadian tour for the Capitals. They visit the Oilers in Edmonton on Thursday.